Growing up in the northeastern part of the United States, I didn't really know what buckeye candy was. The chocolate covered peanut butter mousse is named after the nut of the Ohio buckeye tree and it's popular in the Midwest. But, as with everything else, the internet has brought regional specialties to the attention of the rest of the country. I absolutely love peanut butter so I knew I would love buckeyes even before I finally tasted them. I could order them from catalogs, I'm sure, but they're still not easily obtained in candy stores here in New York. Fortunately, they're so easy to make that I don't need to locate them. I can just make a batch whenever the craving hits. As much as I love peanut butter, though, I also love tahini and it acts in a similar way to peanut butter in recipes. 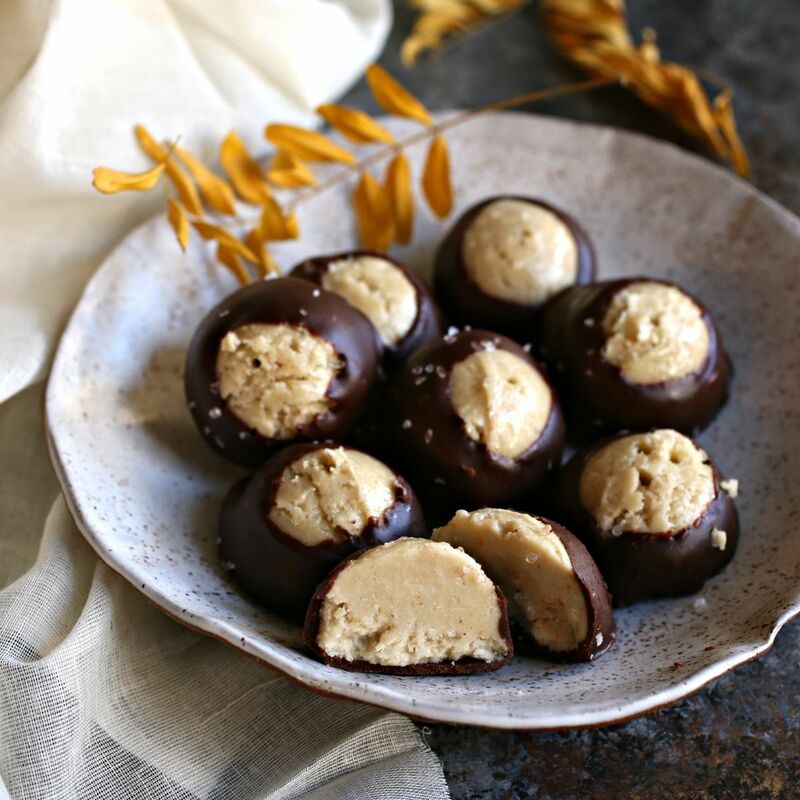 Clearly I needed to make a batch of tahini buckeyes to see if they would be just as good. Yup. They sure are. A different flavor, of course. They taste of sesame seeds, not peanuts, but they're just as delicious and certainly don't last long around here. Combine the sesame paste, butter, vanilla, confectioner's sugar and salt in a bowl and mix until thoroughly combined. Use a small scoop (approximately 1 oz.) or your hands to form balls and place them on a dish lined with parchment paper. Insert a toothpick into each ball to make them easier to dip in the chocolate. Place the formed candies in the freezer to harden while you make the coating. Place the chocolate chips and butter in a bowl set over a pot of simmering water and stir occasionally until melted. At this point, the chocolate may seize up a little. If so, add the tablespoon of milk or cream and continue stirring until it's smoothed out again. Remove the peanut butter balls from the freezer and, gripping by the toothpick, dip each one about 3/4 into the chocolate. Place them back on the parchment paper, sprinkle on a bit of sea salt and refrigerate for about an hour for the chocolate to set up. Serve them with or without the toothpicks.